A good resolution for printing photos is 300 dpi (dots per inch). Anything below will print pixelated. Most images displayed on a monitor has a resolution between 72 dpi and 96 dpi, which means it may look great on your monitor but not look great when printed. Hire a professional photographer or take your own digital pictures. Plan your picture day far enough in advance so it convenient of all participants and doesn’t interfere with the production of the book. Set a deadline for pictures being submitted and specifications for 300 dpi. 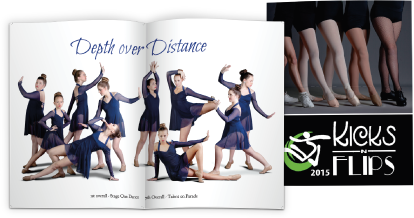 Showcase a picture or collage of photos on the cover of the program best describing your recital. Include the director, coaches, teachers and instructors, individual performers, classes, activities, action shots and pictures from last years event. Liven up your program with people in funny situations and funny sayings to go with the pictures. Include picture ads of your students. If you choose to sell advertisements in your program, you can add a nice profit to your bottom line! Advertising can be sold to business’ to cover the cost of the program and make extra money. Pictures ads of the students are purchased by the families, friends and business to show support, enthusiasm, congratulations and express best wishes for the student. Different size ads can be sold to sponsor (full page, half page, quarter page, and business card size page, 8 on individual page). Advertisers could put couplons and.or specials on their ads to entice people to buy their products or services. Ask local businesses for help with funds in return for free product placement within the program. SInclude a sponsors page with a list of everyone who has contributed funds. Keep of record of past sponsors to contact for next year’s program. Keep left over and previous programs for people to see and buy. Consider charging for your program to earn more funds for your company or studio. Print posters to advertise your recital. Print and sell Calendars and Coloring Books to your audience. -Set up numbered pages as single pages. • In the image above, Page 1 is the Front Cover. • The Inside Front Cover is Page 2. • The inside pages continue in order, Pages 3, 4, 5 & 6. • The second to last page is the Inside Back Cover, Page 7. • The last page is the Back Cover, Page 8. A printed schedule and description of events including order of activities and duration. A brief description of the company or studio. Information about the directors, instructors, and volunteers. This company was great to work with! Software was easy. Printing was fast, and shipping was faster. I can't ask for more! Will be using again in the future.